When you ride in a motor vehicle, minutes feel like, well, minutes. However, when kids, especially young children, ride in a car or bus, a short period of time can feel like forever. And a bored child can quickly turn into a rowdy and disruptive child. In addition to saving the bus driver from daily headaches, school bus games provide entertainment and safety for all passengers on board. Games designed for school buses keep children in their seats and happily distracted for the duration of their journey to and from school. License Plate Game: Chances are, growing up without tablets and smartphones, you played this one as a child yourself. The rules are fairly simple. Participants create a list of the 50 states and divide the group of players into teams. As children ride to or from school, they carefully monitor the license plates of the cars driving by to see which team can identify the most “out of towners.” This game can be played for the duration of a single trip, a week, a month or even the entire semester. Additionally, you can collect license plates based on location, age, design, vanity plates, etc., to keep the game interesting. 20 Questions: Unless you were born in the digital age, you are probably familiar with this one. This classic traffic/school bus game has undoubtedly kept millions of bored passengers entertained on the roadways of America for decades. The game works as follows: One child thinks of a person, place or thing. The other children on the bus are allowed to ask him or her up to 20 questions in order to determine the identity of the person, place or thing. Questions must have yes or no answers. The winner may then pick his or her own person, place or thing for everyone else to guess. Acronym Game: Another fun license plate game for your kids to play on the school bus is the acronym game. First, you pick a random license plate on the road. Then you pretend the letters of the license plate are an acronym for a made up word or phrase. The silliest/funniest acronym or phrase wins. For example, let’s say the license plate you spot reads: TC4DB. You might say, “The Center 4 Dancing Bears”. This school bus game is good because it forces your child to use his or her imagination to stay distracted. Find the Alphabet: Yet another classic traffic/travel game is Find the Alphabet. Basically, players compete to see who can spell out the alphabet first. There are many variations to the rules, but classic play style requires participants to only pull letters from signs and fixed objects, not moving vehicles. Should any player spot a graveyard, he or she may yell out “graveyard!,” thereby resetting all players back to the letter “A”. Most school buses do not have seat belts and therefore, in order to remain safe while in transit, passengers should behave responsibly and stay seated. Of course we are talking about kids here, so these are tall orders. 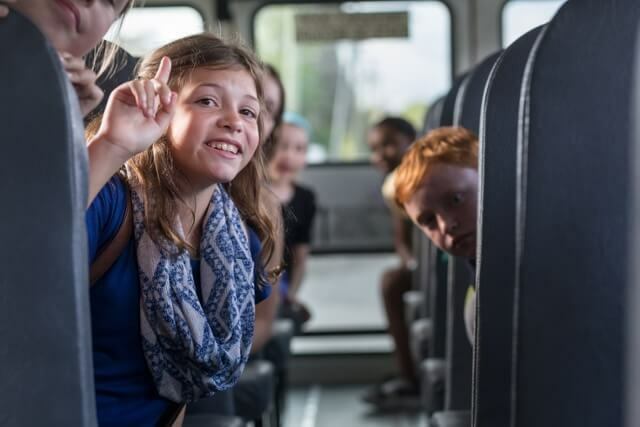 In addition to distracting your child long enough for him or her to be safely transported to school, bus games promote mental activity and social interaction with peers. Such games can also help prevent bullying since bullies tend to pick on solitary kids who are not interacting with anyone else.